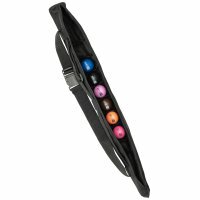 Minigolfballs or Putt Putt Balls come in many different qualities. The most basic are the standard Minigolfballs. 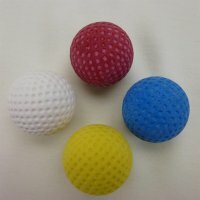 You use one ball for every minigolf course. 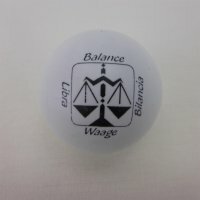 Almost every serious minigolf player uses a set of miniature golf balls. 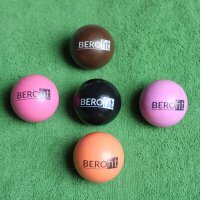 There are three types of Minigolf courses: Betong, Eternit and felt. Every Minigolf course has 18 different tracks. We would suggest to start with a set of Minigolf Balls. 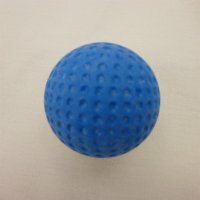 3, 6 or 8 Minigolfballs allow you to adapt to every course. this is the best way to find out, if you like to play Putt Putt this way. 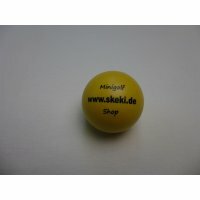 The difference to the type of minigolfball that your local minigolf course gives you will make you enjoy your game even more. Minigolf Starter Set (Standard) 7 pcs. Minigolf Starter Set (Standard) with Minigolfball Bag 8 pcs. Minigolfball set Smilie Competition Quality 10 pcs.